FP7 Combination of Collaborative projects and Coordination and Support Actions - Integrated Infrastructures Initiative project (I3). (Grant agreement: 283595, Call: FP7-INFRASTRUCTURES-2011-2). 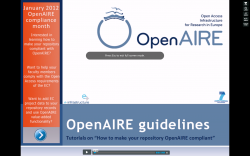 OpenAIREplus is designed to build a 2nd-Generation Open Access Infrastructure by significantly expanding in several directions the outcomes of the OpenAIRE project, which implements the EC Open Access (OA) pilot. Capitalizing on the OpenAIRE infrastructure, built for managing FP7 and ERC funded articles, and the associated supporting mechanism of the European Helpdesk System, OpenAIREplus will develop an open access, participatory infrastructure for scientific information. It will significantly expand its base of harvested publications to also include all OA publications indexed by the DRIVER infrastructure (more than 270 validated institutional repositories) and any other repository containing peer-reviewed literature that complies with certain standards. It also will include the linking of publications with datasets, enriching the information space and establishing connections with other infrastructures and services.